Taking yet another step to promote Cyber Security in the Middle East region, ITA-Oman and OCERT incollaboration with White Paper Summit and Nispana Innovative Platforms is putting together the 6th Annual Regional Cybersecurity Summit 2017 to be held in Muscat, Oman. Experts in cybersecurity will join hands in this platformto debate and discuss how best to protect businesses and organizations from the threat of cybercrime by establishing strong and intelligent cybersecurity on a local, national and international scale. 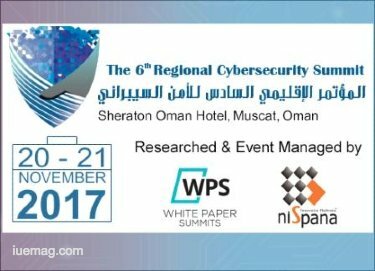 This two day summit is scheduled on the 20th& 21st November 2017 in Muscat, Oman and will present all the participants with an excellent opportunity to network with peers, share divergent viewpoints as well as identify internationally renowned cyber security solutions that can be used to totally eradicate cyber-attacks. Traditional security methods such as next generation firewalls and other reactive measures are losing the fight against a new breed of attacks. It is also very vitalto build strong talents and human capacity in the field of information security across the region and to increase the information security awareness levels. Due to the growing demands, there is a huge increase in the requirements for cyber security experts across all the major industries. Recent cyber-attacks have created the need to establish a regulatory and legislative frame-work to counter these attacks across the region. Now is the time for all the CERTS to come together under one roof and discuss the strategies and techniques for combatting cybercrimes. This summit will feature an array of presentations and interactive panel sessions from international and regional experts to address current challenges faced and come up with strategies to pave the way for a cyber-safe future. Nispana Innovative Platforms Pvt. Ltd., a global provider of the finest business intelligence solutions today provides business leaders around the world with real time competitive B2B platforms. Working towards providing a multi-dimensional business catalyst, focusing on re-education, networking and most importantly deal making opportunities for all attendees is what we strive towards. We help Global Corporate Buyers, Governments, Industrial Experts and Solution Providers respond to the challenges at hand and opportunities created by worldwide business drivers. We catalyze the process of business. We organize high profile B2B summits and meets to address some of the issues faced by businesses globally in order to ensure that every one of our clients get maximum Return on Investment. The iUeMagazine team is delighted to work with the 6th Regional Cybersecurity Summit 2017 as Online Media Partners & is expected to bring Unlimited Inspiration for all readers from the proceedings of this event. Staying tuned to the enriching updates from this event is recommended. Any facts, figures or references stated here are made by the author & don't reflect the endorsement of iU at all times unless otherwise drafted by official staff at iU. This article was first published here on 14th August 2017.